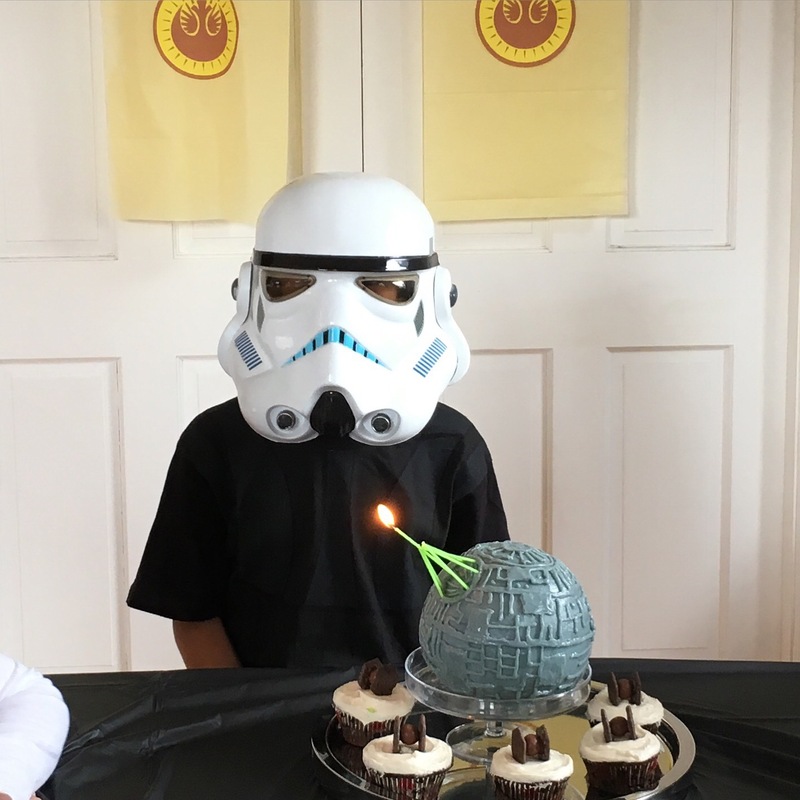 It was easy picking the theme for my son’s 10th birthday as he’s a big Star Wars fans. 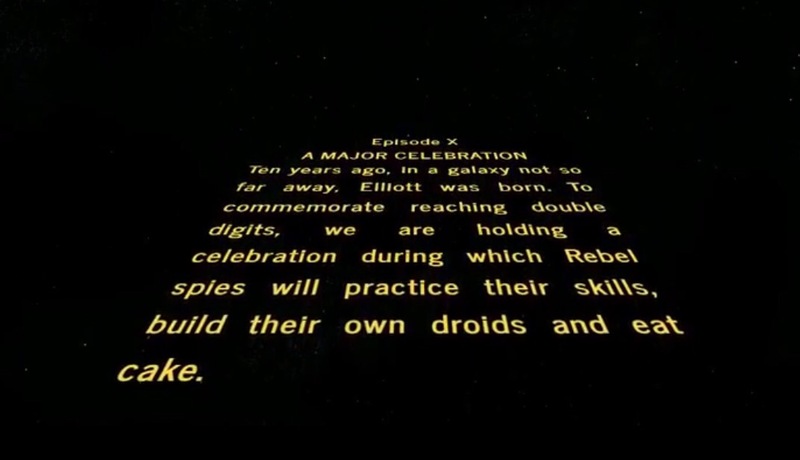 First up, the invitation was the intro from the movies. I came up with the text and entered it into the Star Wars Crawl Creator. I then uploaded to file to YouTube and emailed that out as the invitation. 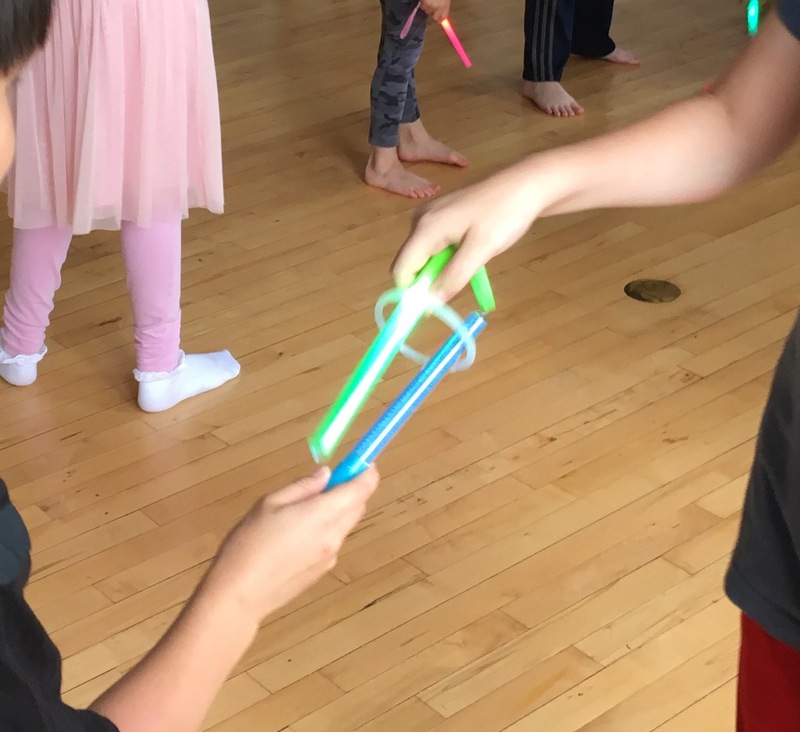 They also played Lightsaber Pass with small light wands and glow bracelets. 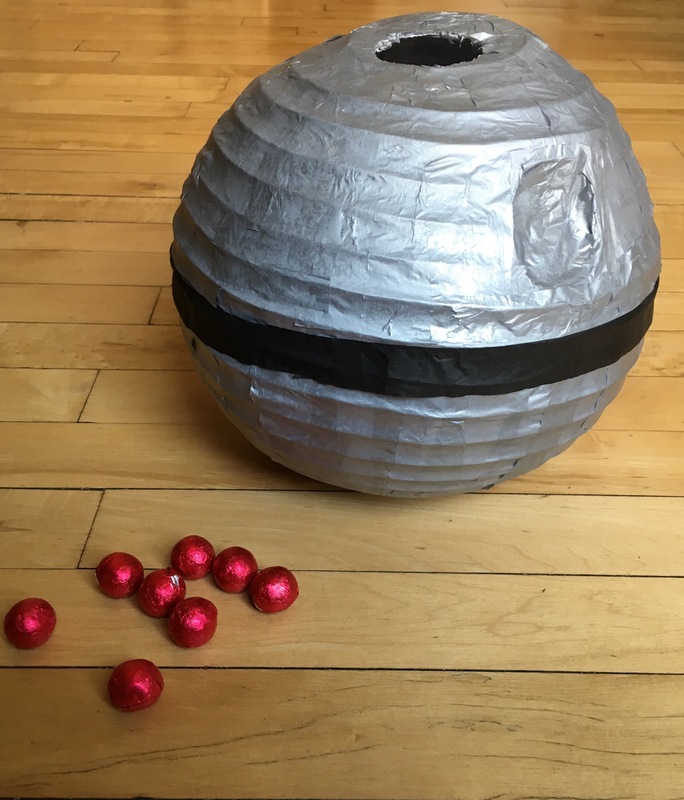 And Detonate the Death Star, where they dropped chocolate into a “Death Star” made from a paper lantern covered with silver and black tissue paper. 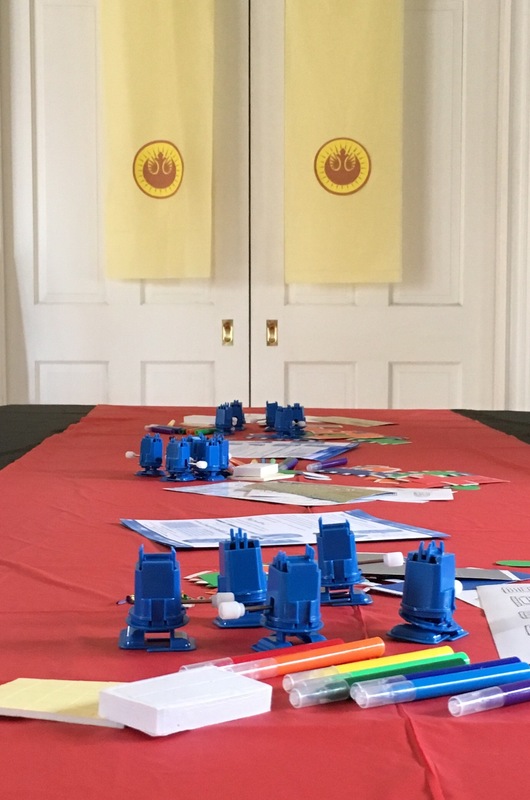 The final activity was a “Build a Droid.” I ordered these kits for everyone to come up with their own creations. I saw the tutorial for these banners on MayTheFourthBeWithYouPartyBlog.com (©Anette Nam Design) and thought they looked great and were such a quick and easy way to decorate. 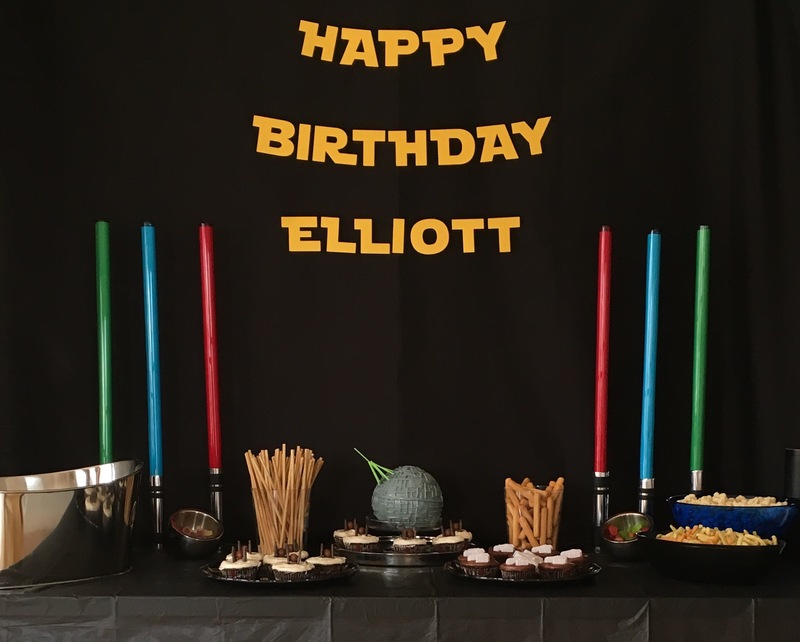 Anette also has tons of great Star Wars party ideas and printables. 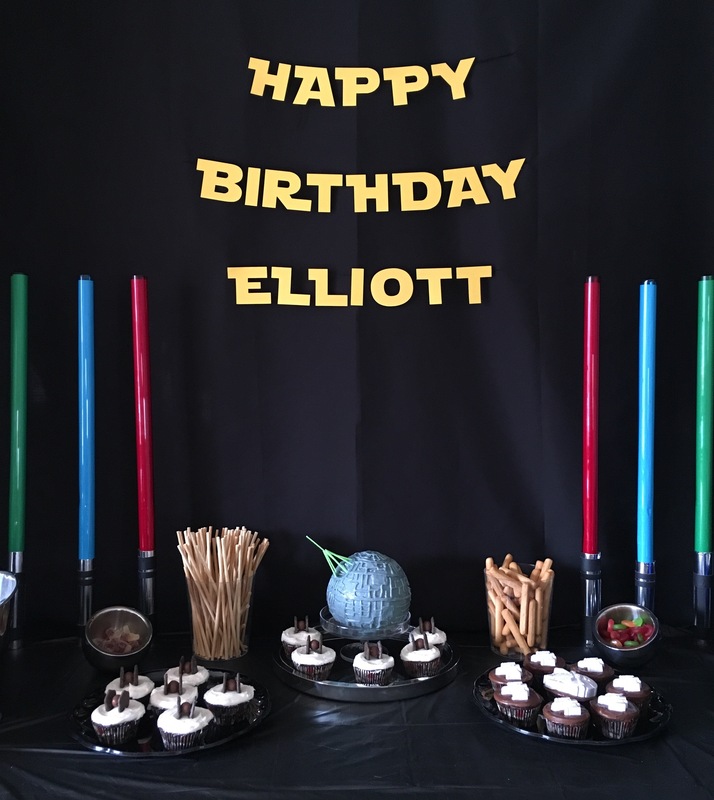 For the party table, I used the same fluorescent light covers to make light sabers and cut out a banner using the Star Jedi font and my Silhouette cutter. 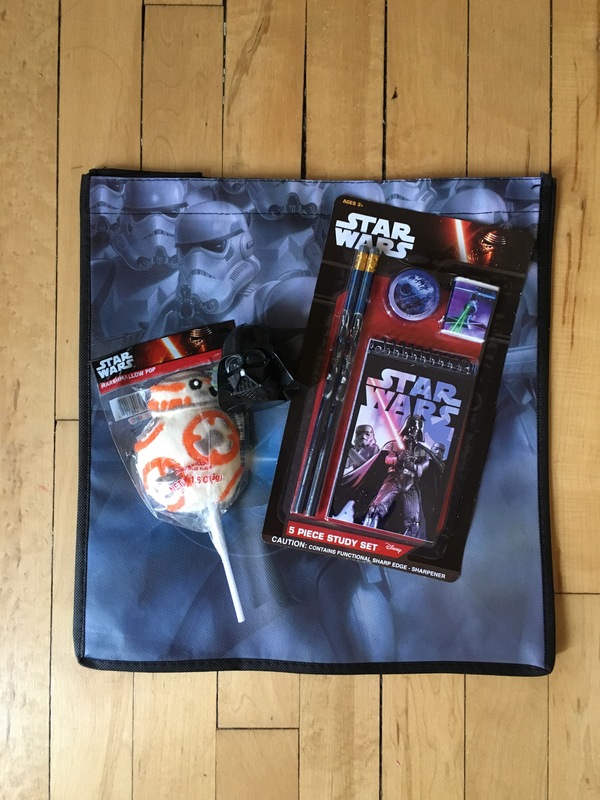 The goody bags are from the Dollar Spot at Target and hold Star Wars stationery and candy. 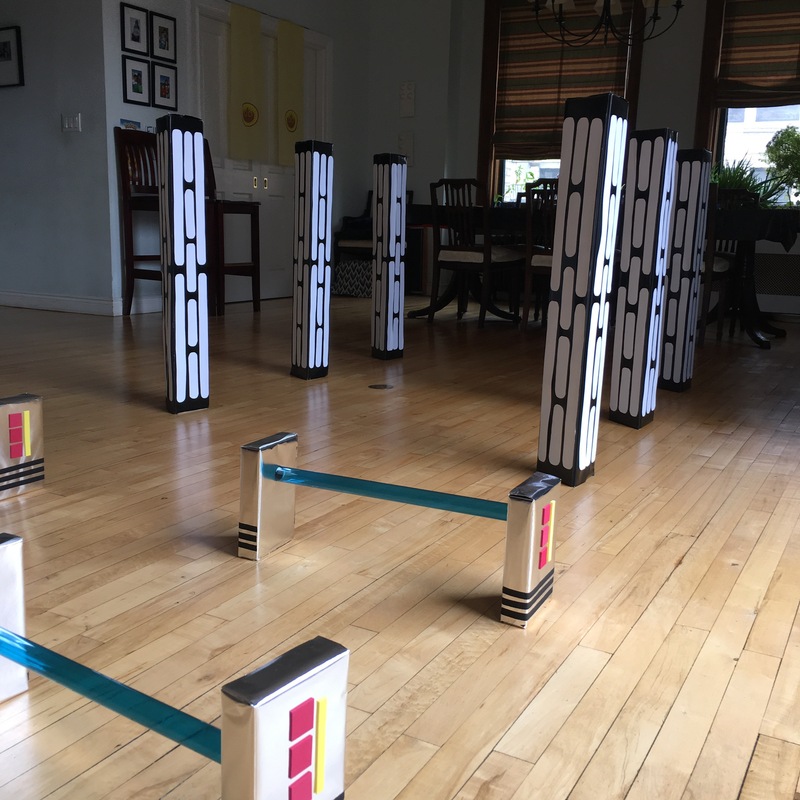 The light wand, droid and glow bracelets from the activities also went in at the end. 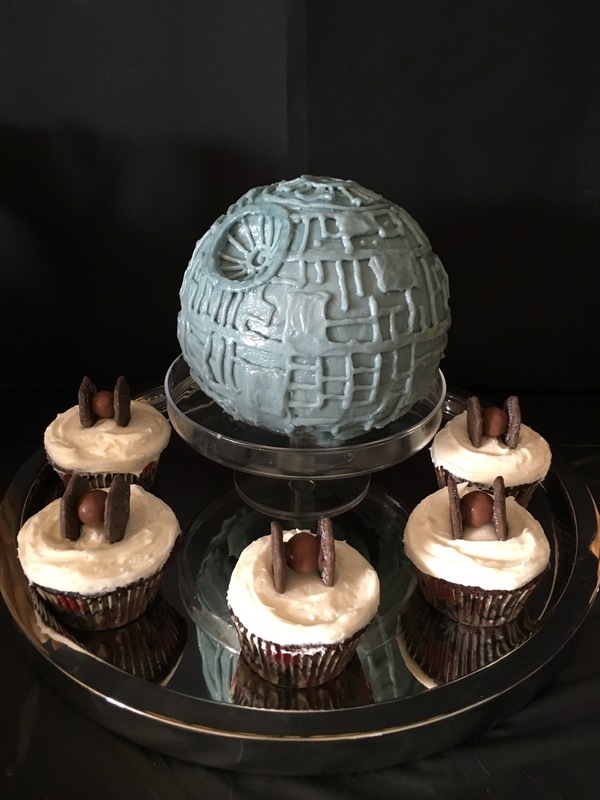 The centerpiece of the table was the Death Star cake. I followed Nerdy Nummies’ tutorial and I think it came out pretty nicely. We also had cupcakes topped with TIE fighters. Instead of marshmallows like I saw online, I went with Whoppers. The finishing touch was using thin green candles to make the laser beam. 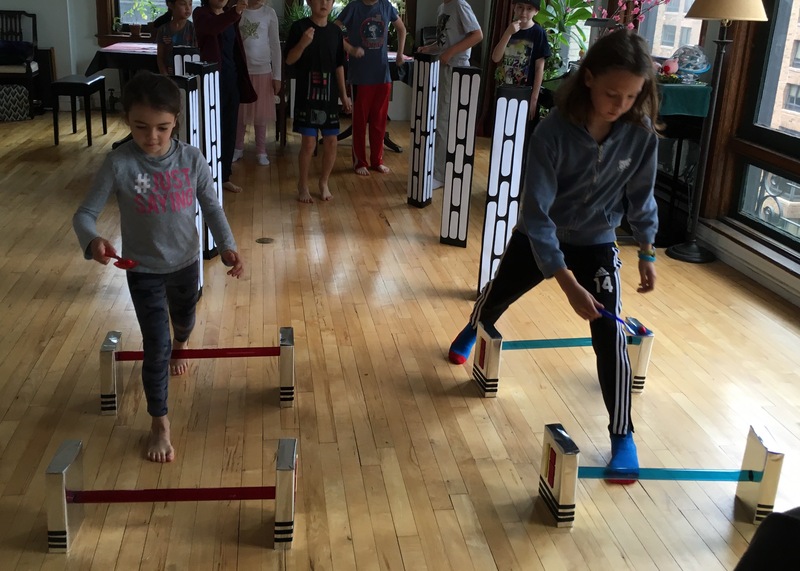 All in all, another successful party! I thought I had linked. I must not have saved properly. Sorry. Just fixed it. THANKS for the call-out!!!!! Looks like you guys had a fantastic party! Thanks for sharing your photos! Very cute! These were definitely very creative ieas.